With more than 50,000 Muslims signing a petition to end the practice of Triple Talaq in their community, the pressure seems to be increasing on the Muslim personal law board in India. Amidst this bickering, many women rights activists have repeatedly pointed out that more than 20 Muslim majority countries have already abolished Triple Talaq - a fact unknown to many. 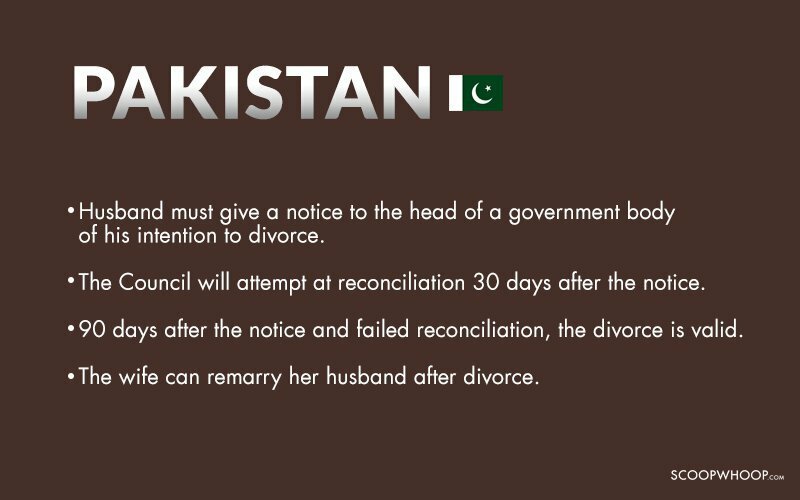 We bring you the revised divorce policies of five major Muslim countries in the world, some of which abolished Triple Talaq as early as 1950. 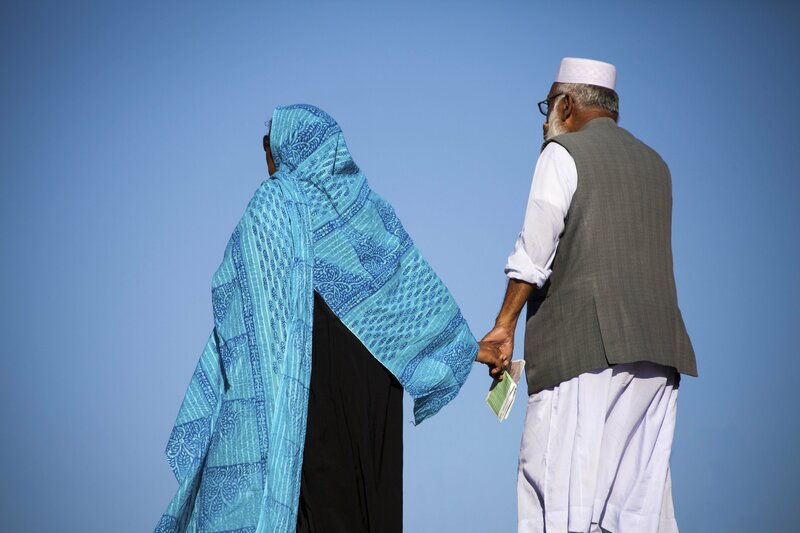 There are four methods of separation laid out in Islam - Talaq (divorce by husband), Khula (separation by consent between the two partners), Faskh-e-Nikah (dissolution of marriage) and Tafweedh-e-Talaq (divorce by wife). It's Talaq that dominates the marital disputes in the contemporary Muslim world. Egypt was the first country to reform its divorce system in 1929. They did it on the basis of interpretation of Quran by 13th century Islamic scholar Ibn Taymiyyah, also followed by many other Muslim majority countries. 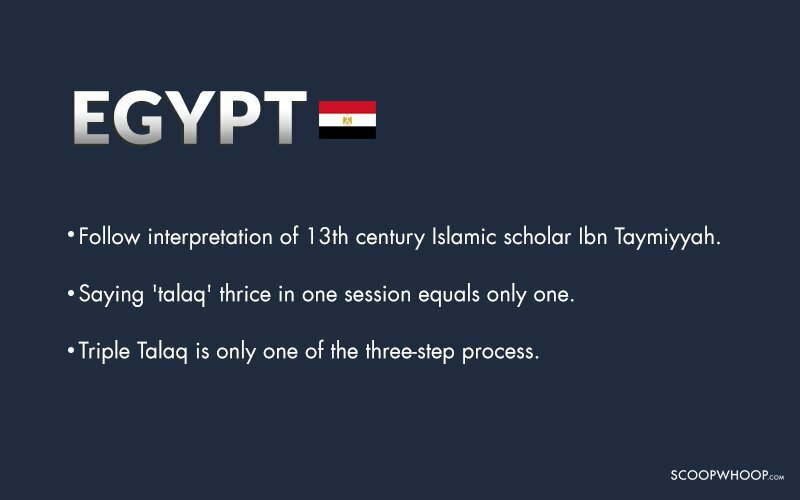 According to Taymiyyah, 3 pronouncements of the word 'talaq' in one session equals only one. 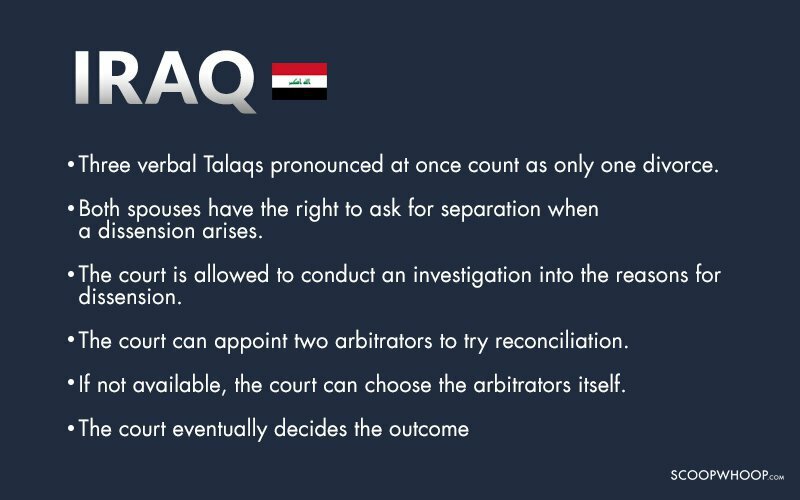 Also, saying 'Talaq talaq talaq' in one go accounts for one of the three steps in the process. There is a 90-day waiting period after the first step. In a paper titled 'Reforms In Triple Talaq In The Personal Laws of Muslim States And The Pakistani Legal System: Continuity Versus Change', Muhammad Munir, a scholar at International Islamic University, Islamabad, Pakistan explains the process of divorce in Egypt thus: "A divorce accompanied by a number expressly or implied, shall count only as a single divorce and such a divorce is revocable except when three talaqs are given, one in each menstrual cycle." 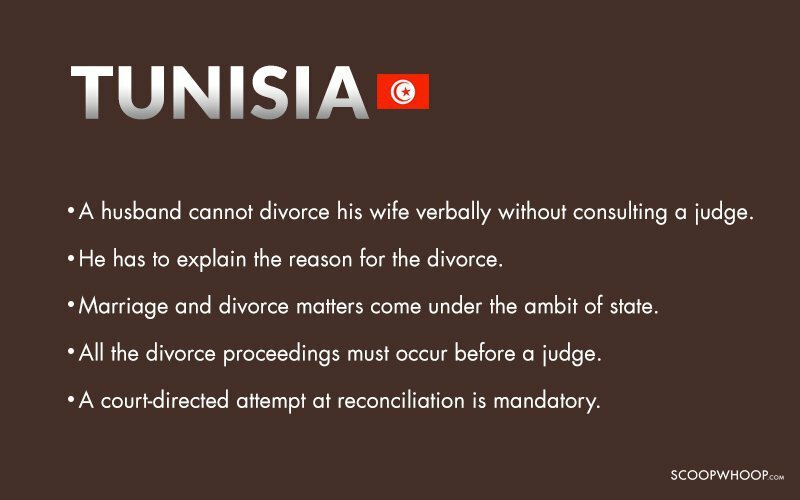 According to the Tunisian Code of Personal Status, 1956, a husband cannot unilaterally divorce his wife verbally without consulting a judge and without explaining the reason for it. The institution of the marriage thus falls directly under the ambit of state and judiciary. As per the law, all divorce proceedings must occur before a judge and a court-directed attempt at reconciliation is mandatory. While both the parties have the right to ask for a divorce, each of the partner needs to explain their reasons for severing the nuptial knot. The Tunisian Code also makes both husband and wife to compensate, if the judge feels that one of the party has been harmed by the other. While not a Muslim majority country, Muslim experts like Muhammad Munir have termed Sri Lanka's Marriage and Divorce (Muslim) Act, 1951, amended up to 2006, as the "most ideal legislation on triple talaq." According to the Act, a husband intending to divorce his wife has to give notice of his intention to the Qadi (Muslim judge) who, along with the relatives of the partners, elders and other influential Muslims of the area, shall attempt reconciliation between the spouses. After 30 days, "the husband, if he desires to proceed with the divorce, shall pronounce the talak [sic talaq ] in the presence of the Qadi and two witnesses." The rules governing the abolition of Triple Talaq in Pakistan were formulated after recommendations by a 7-member commission on marriage and family laws in 1956. A key recommendation was that the pronouncement of three Talaqs in one go should be counted as one. Similar to Egypt, the husband must pronounce Talaq in three successive menstrual cycles. Another recommendation was that the husband should secure an order of divorce from a matrimonial and family court before pronouncing divorce to his wife. But it was so severely criticised that the Muslim Family Law Ordinance (MFLO) passed by the Pakistani government in 1961 ignored it. The husband must give a notice to the Chairman of Union Council (a government body on these matters) that he wants to give divorce. After 30 days, the council will try reconciliation through Arbitration Council during the entire waiting period of 90 days. If it fails, the divorce is valid. If the case of pregnancy, the talaq will become valid only after 90 days of being pregnant. Also, the wife can remarry her husband after divorce. During the period of left-leaning revolutionary government in 1959, Iraq became one of the first Arab countries to replace Shari'a courts with government-run personal status courts. The landmark step abolished the previous system of Personal Status Courts which were based on sectarian interpretations of the religious text. According to Iraq's Personal Status law, "three verbal or gestural repudiations pronounced at once will count as only one divorce." Under the 1959 Iraq Law of Personal Status, "both spouses have the right to ask for separation when a dissension arises between them, whether before or after consummation."